Following the success of Haco AG in Switzerland, Haco Asia Pacific Sdn. Bhd. was founded in 2004 with its manufacturing plant strategically located in Shah Alam, Malaysia. 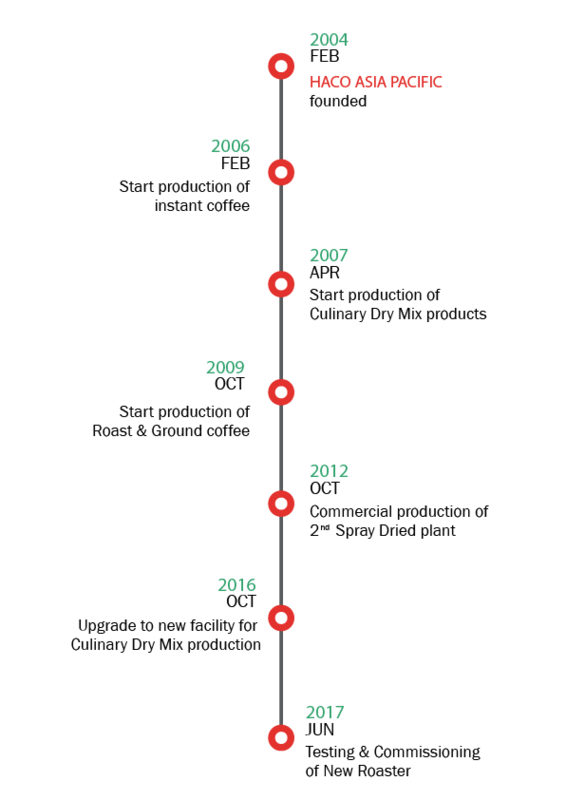 Manufacturing of coffee products commenced in 2006 and since then, Haco Asia Pacific has continuously asserted itself in the global market by producing unique and innovative coffee blends of a consistent high quality. As a reputable manufacturer of roasted whole beans, roast & ground coffee and spray-dried coffee, including formulations of premium blended coffee products for some of the renowned global coffee brands, Haco Asia Pacific is constantly innovating and adopting the latest manufacturing technology for sustainable growth. Our culinary dry mix products are a natural choice and do not contain MSG, trans fats, preservatives or artificial colouring. With its Swiss origin for over 90 years, Haco Asia Pacific has also carefully perfected its manufacturing process of preserving and blending the delicate aromas and flavours of food ingredients to create products with excellent taste, perfect convenience and of the finest quality. Our company is renowned for its unique and innovative food products. Customized products and services are distributed worldwide in record time for an extramely wide spectrum of customer needs. Haco Asia Pacific is your ideal collaborator with a highly specialised team and processes that also comes with a network of support for worldwide distribution, application services, a comprehensive range of products and technologies as well as the standards of the highest quality. Be inspired by our comprehensive range of premium products made from the finest ingredients and best manufacturing process ever. Haco Asia Pacific always strives to give you endless time-saving possibility to prepare a wide range of premium culinary creations without compromising on quality. Bring your vision to life with our innovation and world-class standards in developing your very own proprietary products. 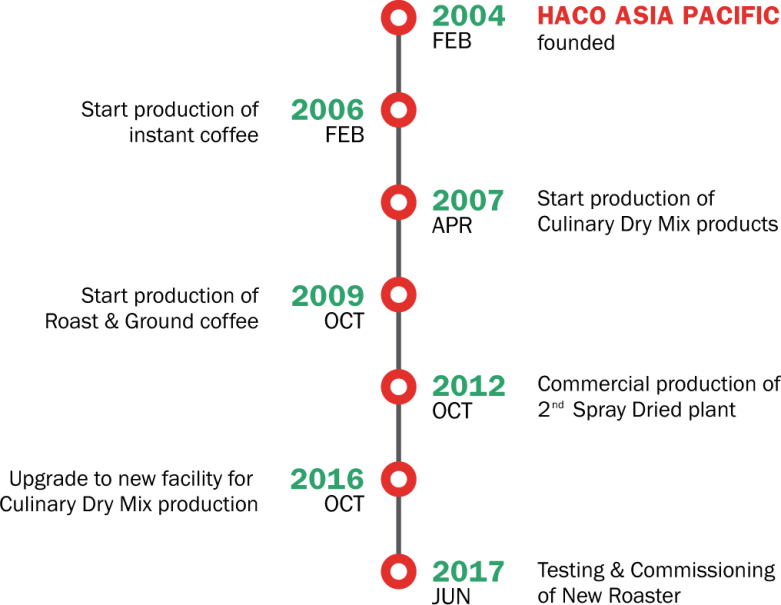 Haco Asia Pacific has been producing coffees for internationally renowned retailers over the decades. Our retail brand, SUISS, symbolizes a finer taste of lifestyle – premium, indulgent and full of natural goodness. Made with Swiss precision from the freshest & finest ingredients, it provides consumers an experience that is “Undoubtedly Swiss”.